Generally, the keto smoothie recipes and low carb shakes that I come across have some eerie similarities: thick and chocolaty, peanut buttery, and loaded with protein powder. Oh yeah, and as little fruit as possible…or none at all. Which, if you’re a chocolate peanut butter protein shake fanatic, is awesome! But, what happens when you’re choco-peanut-buttered out? Or if you don’t even enjoy that combo in the first place? What if—*gasp* —you want something fruity and refreshing to sip on? Watch my Keto 101 video to learn about how ketosis works in the body and the basics of the high fat low carb lifestyle. Or, if you’re transitioning into a ketogenic lifestyle, check out my How to Get into Ketosis Fast video for tips on how to get through the keto flu more quickly! 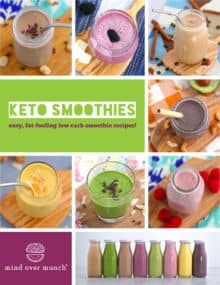 Today, I’ve got 8 deliciously easy keto smoothie recipes for you, each with a variety of ingredients, unique flavor profiles, and that are all designed for low carb and ketogenic lifestyles. On average, these keto smoothie recipes range from 4g to 7g net carbs each. The highest is 10g net carbs, and some have as few as 3g net carbs! And yes, some are fruity, some are veggie-packed, and there’s even one that’s (!) chocolaty. 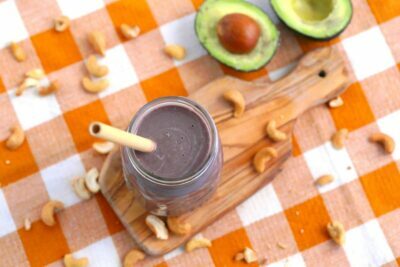 I’ve included 5 of the recipes in this post, along with a FREE Low Carb Smoothies Recipe eBook that you can download with 3 BONUS keto smoothie recipes! in ketosis. But, some people can only handle 20g of carbs per day, or less. 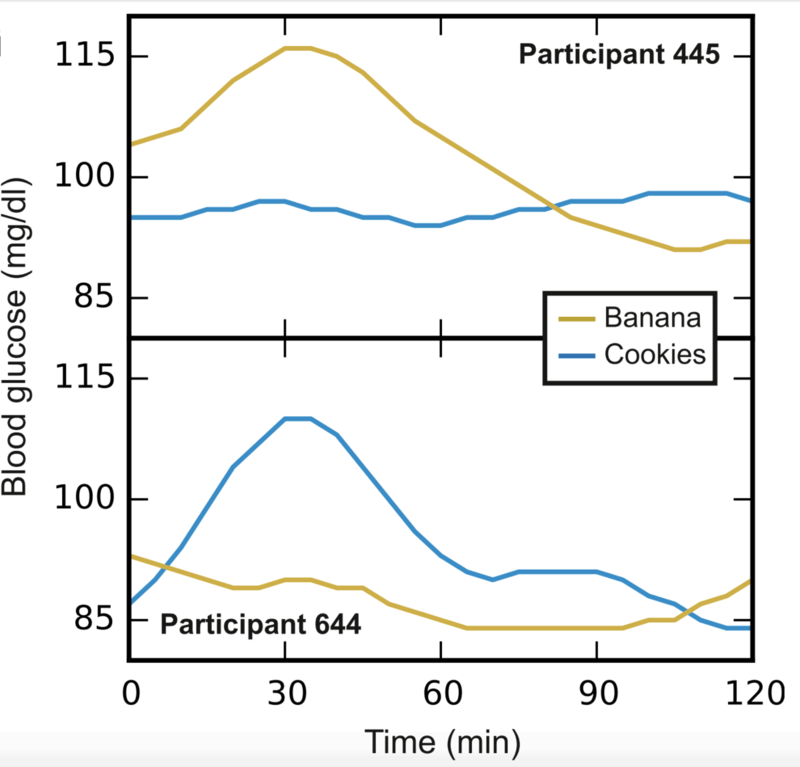 In a study of over 800 people looking at individualized blood glucose response, researchers found that individuals can have drastically different blood sugar responses to the same exact foods. 2 different participants who were each given the same foods, yet their bodies had noticeably different blood sugar responses. 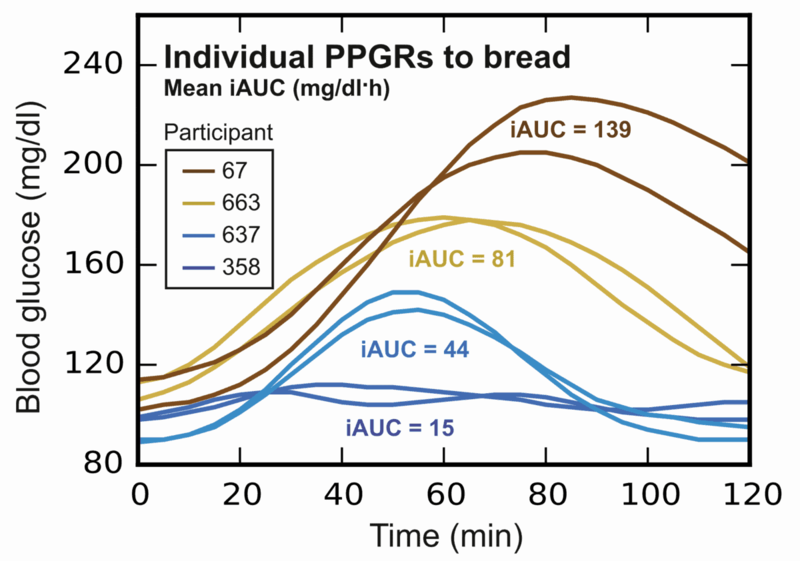 4 different people, each with very different blood sugar responses to bread. Yet, each individual’s body responded very similarly to bread over multiple trials. to check your blood ketones, you’ll get a sense of your carb tolerance. can handle one with 10g! pineapple all tend to be higher in total carbs, sugars and net carbs. But, most people can have SOME fruit on a keto diet, if they manage their carb intake properly. Again, it will all depend on your individual carbohydrate tolerance, and the ratio of carb to fat consumption that works for your body! And, it helps if you choose fruits that are low in carbs and keto friendly. 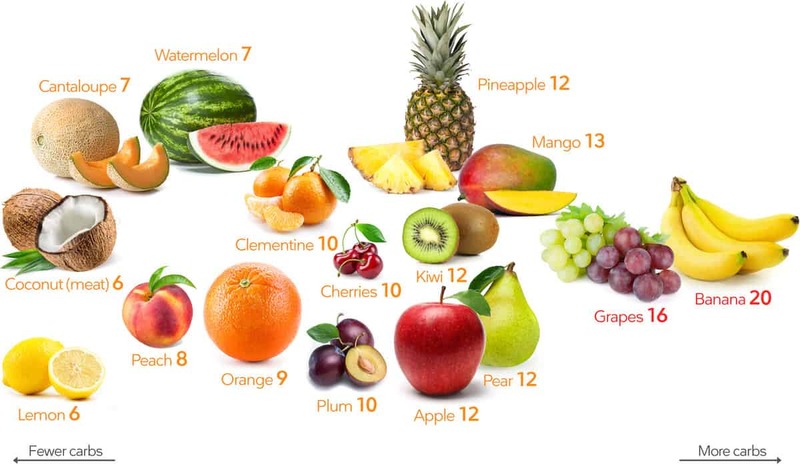 The numbers listed in the image below represent the number of net carbs per 100g (3.5 oz) of each fruit. blueberries (~⅝ cup) = 12g net carbs. are still some of the lowest carb fruits. Again, the numbers provided in the image above represent the number of net carbs per 100g (3.5 oz) of each fruit. Obviously, you don’t want to sweeten a keto smoothie with sugar since it’s pure carbohydrate. Instead, you can opt for no/low carb sweetener options, with little-to-no net carbs. Personally, I prefer to go with natural sweeteners like stevia, erythritol, or monk fruit when I use them, rather than artificial sweeteners. levels. Of course, it will depend on the type of sweetener and your body/metabolism. Just something to think about on your ketogenic journey! In my keto smoothie recipes, I suggest taking it slow and sweetening to taste. Add a bit of the sweetener of your choice, blend, and taste your smoothie to see how you like it. The less sweeteners that you end up using, the lower risk you’ll have of potentially affecting your ketosis! sweeteners) might be playing a part in that struggle. As an alternative protein option, try adding collagen to your low carb smoothies! It’s clean, rich in protein, and the brand that I use is totally flavorless so I don’t even know it’s there. I’ll admit, I’m not a huge sweetened protein powder fan, so I prefer to use collagen. And, I definitely love the joint, hair, and nails benefits that collagen provides! *Also worth noting: consuming too much protein can lead to gluconeogenesis, which is when protein converts to glucose in the body…and we don’t want that. That’s why I stick by the keto mantra: high fat, low carb, adequate protein! A keto diet is different from a low carb diet. Carb intake does need to be low on a keto diet. But, it’s also important to monitor protein intake, and to eat enough dietary fat so the body can produce ketones as fuel! enough dietary fat to fuel your body in ketosis. Remember, keto isn’t just a low carb diet, it’s also a high fat diet. Yes, carb intake has to be low on keto. Otherwise, the body will use that available glucose as fuel first, since it’s so easy to burn up. BUT, dietary fat also needs to be prevalent enough in the body in order to produce ketones, which become the body’s alternative energy source in ketosis. If you’d like to learn more, I explain the mechanisms of ketosis in the body in my Keto 101 video! fat sources, which you’ll see included in my keto smoothie recipes below! Avocado—highly nutritious, rich in monounsaturated fats and fiber which helps to keep the net carbs low. 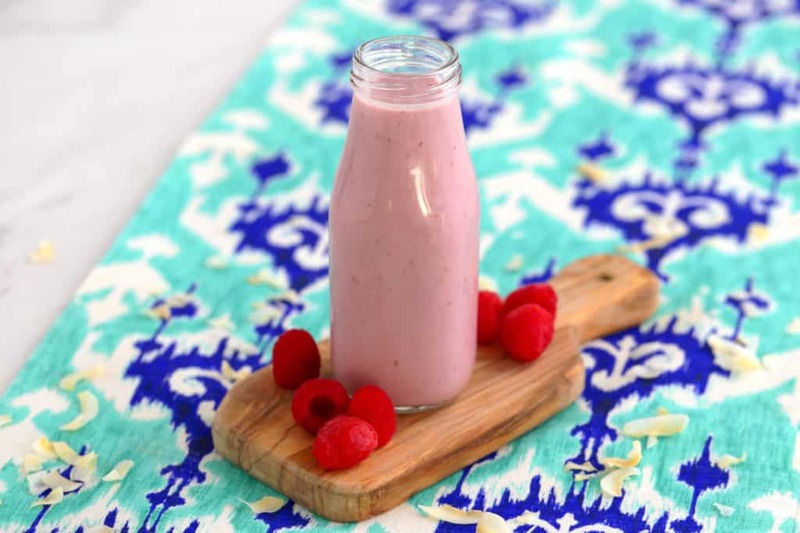 Also, a perfect addition for smoothies with their subtle flavor and smooth, creamy texture! 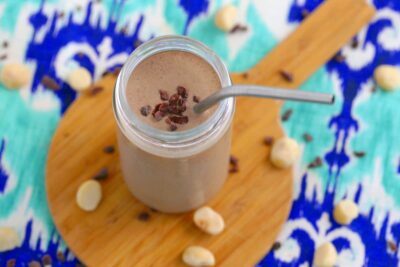 Nut Butters—also a great source of fats and fiber, plus a salty, sticky addition that can make your low carb smoothies more flavorful and thicker in texture. Flax & Chia Seeds—excellent sources of plant-based omega-3s, LOADED with dietary fiber, and they can thicken up smoothies beautifully! Just be sure to use ground flaxseed, because the body can’t digest whole flaxseeds. smoothies, and using coconut milk as your liquid! MCT stands for medium-chain triglycerides, or medium-chain fatty acids. It’s a type of saturated fatty acid that’s found in coconut oil, and it has loads of benefits. Most notably, MCTs are easily digested and they help with ketone production. Plus, they’re burned by the body instantly for quick, clean energy, rather than being stored as fats! Since they’re so easy to digest, MCTs can actually improve your metabolism and help to suppress hunger. And, they can really be beneficial for anyone, whether you’re eating low carb or not! Coconut oil is rich in saturated fats, the majority of which are MCTs, so it’s a great option to add into your keto smoothies. Or, you can also find isolated MCT oils, which tend to have a higher concentration of fats in a smaller volume. It’s colorless, odorless and stays liquid at room temperature, so a lot of people on a low carb diet add it to food, coffee, or smoothies to boost their fat content in their diet. Personally, I like to use Brain Octane Oil from the Bulletproof brand—the folks who crafted Bulletproof coffee, which is a must-have when I’m eating keto! 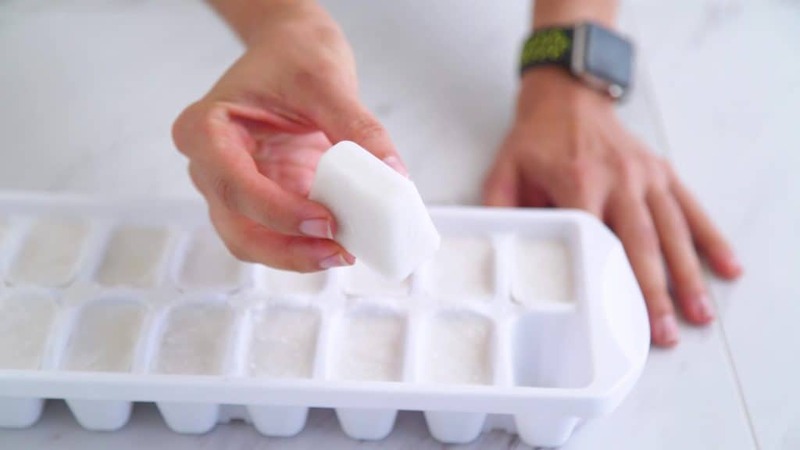 BONUS Keto Smoothie Hack: Coconut Milk Ice Cubes! alternatives to add to your keto smoothie. They help to create that refreshing smoothie texture, but they won’t water down your smoothie like ice cubes can do. And, you can freeze some in bulk to keep on hand when you want them! Just leave them in the tray or store in a sealed plastic bag in the freezer. I especially love using this hack when I’m making iced coffee or a keto Bulletproof shake! (I’ve got a recipe for one of those for you down below!) But you could really use them in ANY smoothie that you want for added creaminess and nutrition. I hope that these tips are helpful for you, and I hope you enjoy these keto smoothie recipes and the eBook download. Leave a comment and let me know what you think, and I’d love to know what your favorite low carb smoothie combo is! Add a dose of protein to your morning with this sweet, creamy keto protein shake—with NO protein powder! Collagen powder is a cleaner alternative to most protein powders, with incredible joint, hair, and nail benefits. You won’t taste it, but your body will appreciate the nutritious boost! Yields 1 keto protein shake. 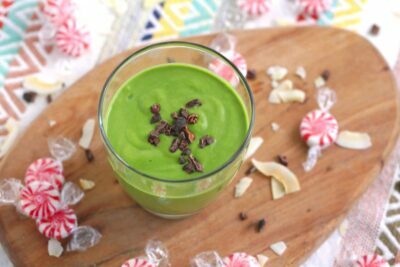 This vibrant keto green smoothie is loaded with color, nutrients, and veggies! 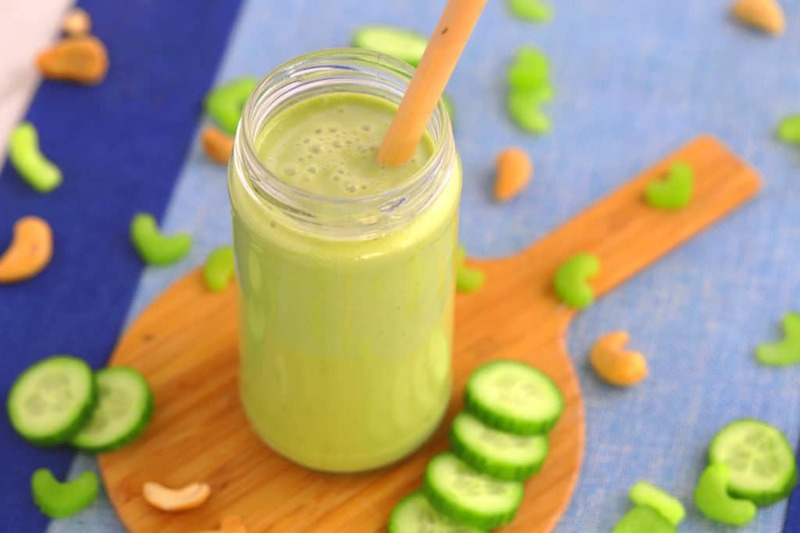 Cucumber and celery create a refreshing flavor burst, while the avocado and cashew milk keep the texture silky-smooth. With a dash of energizing MCTs, it’s a simple, sippable low carb breakfast to fuel your morning! *Nutrition calculated using unsweetened cashew milk, 75g (½) medium California avocado, & coconut oil. 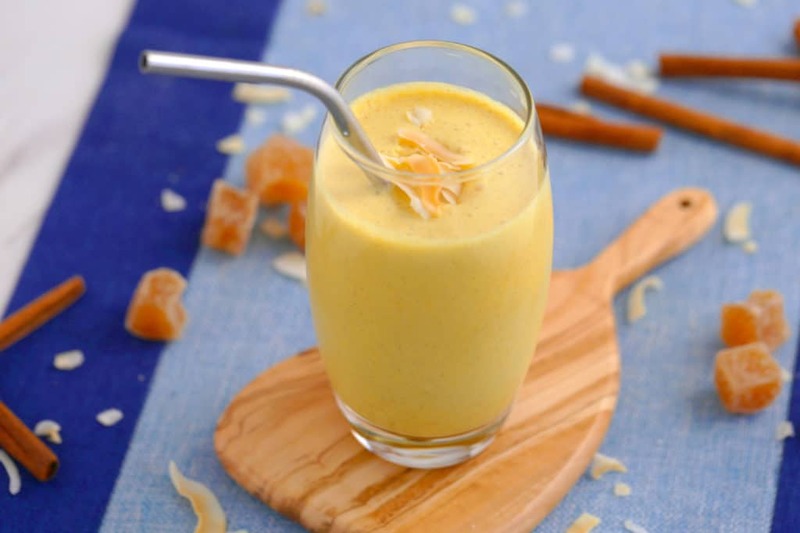 For an exciting flavor kick AND a superfood boost, try this anti-inflammatory golden milk smoothie! It’s made with 2 of the most powerful anti-inflammatory foods on Earth: turmeric & ginger. Blend it up with frozen coconut milk cubes for an ultra-creamy keto smoothie that’s rich in wholesome fats—with just 4g net carbs! Shake can of coconut milk, blend the milk, or whisk well until smooth with no clumps. Pour into ice cube tray and freeze 3-4 hours, or overnight. *Nutrition calculated using Thai Kitchen unsweetened full-fat coconut milk & coconut oil. Get your coffee AND on-the-go breakfast all in one cup with this Bulletproof ketogenic shake! Frozen coconut milk cubes add creaminess and nutritious fats, without watering down your coffee. 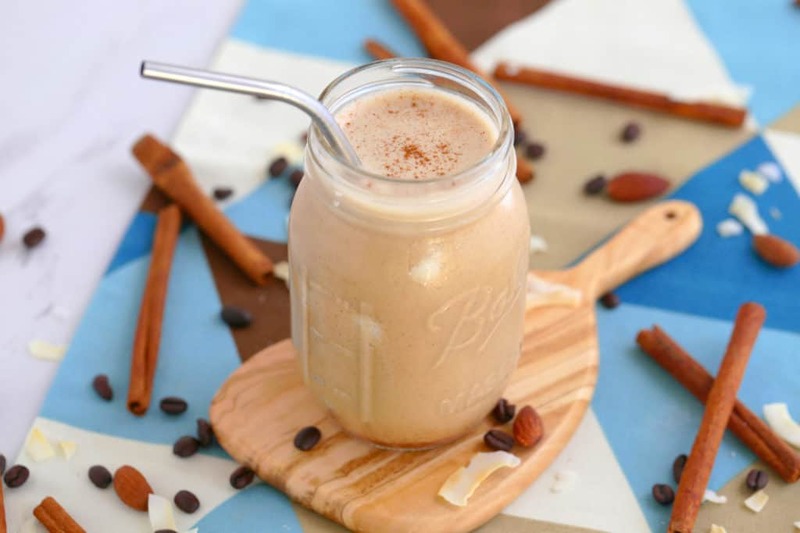 Every cinnamon-y sip of this low carb shake is so satisfying, energizing, and packed with fats for fuel! Yields 1 Bulletproof keto shake. *Nutrition calculated using 3 cubes (6 Tbsp) Thai Kitchen unsweetened full-fat coconut milk, coconut oil, & 1 Tbsp flax meal. Maximize your morning indulgence with this blackberry cheesecake-in-a-cup! 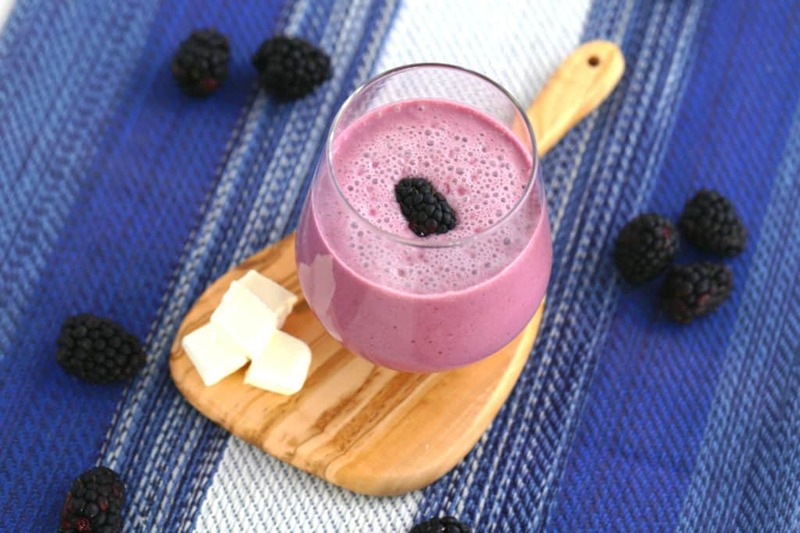 Blackberries are a great low carb fruit and their sweet-and-tangy flavor pairs perfectly with the salty bite of cream cheese. Together, they create a luscious, creamy low carb breakfast smoothie that tastes like a dessert! If you prefer to keep it dairy-free on your keto diet, you can substitute for cream cheese with additional coconut milk instead. But, it won’t have quite the same “cheeesecake-y” taste! Or, if you can find them, there are some almond- , cashew-, and coconut-based dairy-free cream cheeses out there now. I haven’t tried them personally, but they could be worth a whirl if you’re interested! Yields 1 keto breakfast smoothie. *Nutrition calculated using full-fat cream cheese, Thai Kitchen unsweetened full-fat coconut milk, and coconut oil. 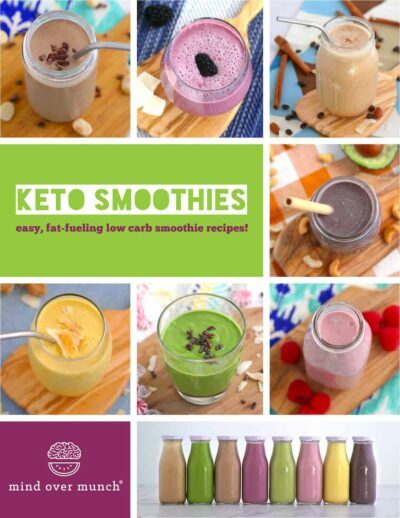 FREE Keto Smoothies eBook Download! 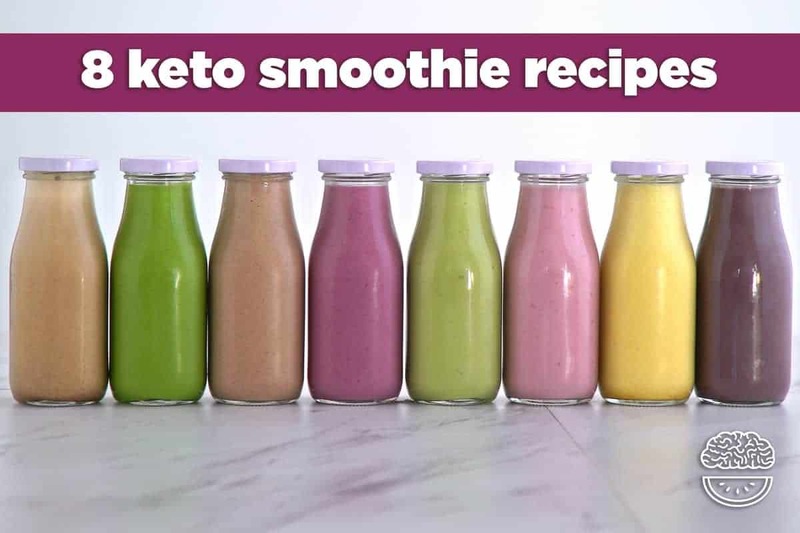 For all of the low carb smoothie recipes from this post, plus the 3 BONUS keto smoothie recipes mentioned above, click to download my FREE Keto Smoothies eBook! https://kenaiorganicfarms.com/wp-content/uploads/2019/01/keto-smoothie-recipes-fb.png 632 1200 KenaiOrganicFarms https://kenaiorganicfarms.com/wp-content/uploads/2018/09/organic-coconut-oil-logo.png KenaiOrganicFarms2019-01-22 03:16:052019-01-22 03:16:058 Keto Smoothie Recipes + Free Downloadable eBook!